As the weather started to show signs of getting warmer, I started wanting a more summery bag. I also really wanted to try sewing something with the new nani IRO laminated cottons. 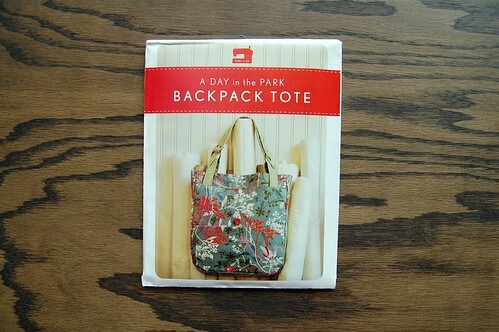 I decided to try out The Day in the Park Backpack Tote. I love the idea that it changes from a tote bag to a backpack. Since I’m out walking with Maisy so much, the idea of having my hands free is pretty appealing. I made one small change to the pattern, which was to make the sides two inches wider. This change was made specifically so that my large camera would fit into the bag. I expected to have a hard time sewing with the laminated fabric, but it was really nice to sew with. Since the fabric has a coating, you really shouldn’t use pins when you are sewing it. Any holes you make won’t go away, like they do in your fabric. Paper clips or binder clips are a good alternative. Since this bag has so many pieces and there are several curved seams, I decided that I would still use pins. I just always made sure that my pins were placed inside the seam allowance, so that the holes they made wouldn’t show up on the outside of the bag. I also used a slightly longer stitch. It’s a really good idea to use a fresh needle on your machine and then change it after the project. I didn’t find that I had any problems with the fabric sticking or slipping on my machine, but you can always use a Teflon foot or place a layer of tissue paper on top and tear it off, if this is an issue. 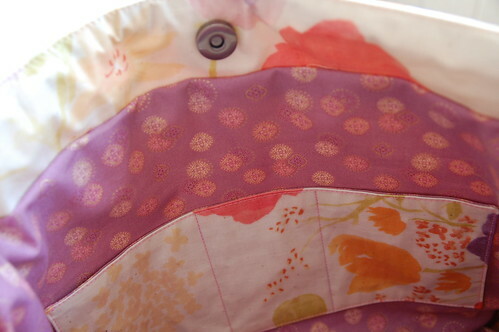 The laminated fabric is made with the nani IRO double gauze and is really beautiful. Much nicer than many of the other oil cloths I’ve seen. People have been buying it to make table cloths, placemats, lunch bags, zippered pouches, totes and dust covers. Putting the bag together was pretty straight forward, but there are a lot of steps. I really couldn’t visualize how the handles were going to work, until I actually sewed them. The key is the ‘O’ ring. (which you can get at the workroom) I used a small amount of echino for the handle, so it looks like there are birds flying up my handles. This bag is a bit smaller than what I normally carry, but that’s one of the reasons I really like it. I need to stop carrying around so much stuff! The bag also has a magnetic snap, a zippered pocket, an outside pocket and inside divided pockets. The design is pretty great. 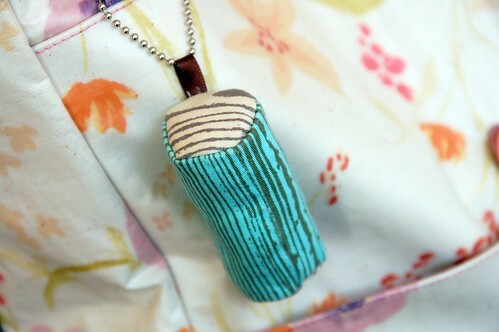 I’ve accessorized it with the little blue fabric log that I got from Killside Krafts at the Love & Rummage Trunk Show. You may recognize that I’m wearing my gingham dress, which I am currently making another version of. I think it’s my new uniform. Ooh, this is also perfect for bicycling – I dislike backpacks, but they really are the best thing while in transit, so it would be nice to be able to carry a tote that converts. Do you carry the pattern/supplies at the workroom? I’ve been needing a new bag for so long and haven’t been feeling any of the patterns I’ve found, but this is exactly what I’ve been picturing in my head. I can’t wait to make my own! my goodness that is a charming design. great fabric choices, of course! I love the bag, and just love love love your dress! I love it! I am still obsessed about your dress too. I really want to make some dresses like that for summer, I just have to get over my fear. 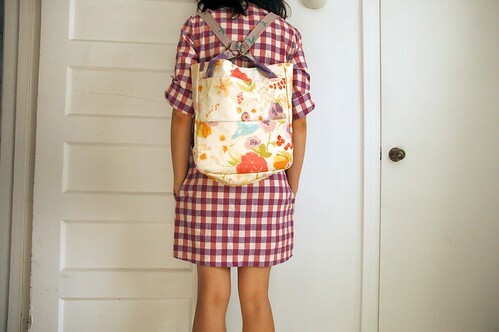 I am looking to make a lunch bag with oilcloth. What a great bag! I should make one like that myself: a) because it’s waterproof and British weather is very rainy; b) because it can be used as a backpack and that’s good for my poor, aching back! That fabric is gorgeous. Wow. I bought that pattern ages ago and have had it sitting in my “to do” pile ever since. This has totally inspired me to get it happening… I might even be able to part with my robots fabric for it. Are you a mind reader? I’m going to come by and pick that pattern up. I picked up some shirts from Valu-Village. OMG this bag is awesome Karyn! I bought the pattern last year from you but I fear I was too ambitious in my purchase as I can’t make heads or tails of the instructions. I hope one day I can figure it out and make a great bag like yours. Dare to dream. such an adorable bag – and I love that you customized it for holding your dslr! Hi Karen, this looks fab! I have access to this fabric here and I have been wondering exactly what to do with it… toiletry bags etc dont seem enticing BUT THIS IS..just had a look at buying the pattern and was wondering if you used the full 1 1/2 yards of heavy interfacing or if you just did the 1/2 yard as it recommends with the heavier exterior fabric such as this. Also just to clarify as I will buy the exterior fabric (dont want it to sell out) while I wait for the pattern to arrive in the mail.. did you need exactly the recommended 3/4 yards in the nani iro laminate? or more? Was the laminate fairy straight fwd to sew.. any pointers? Thanks for all this. You are always an inspiration. I just wished I lived in Toronto! the bag rocks. where did you get the pattern?? karen – i agree with you about backpacks, but it is wonderful to have the option to convert back and forth! we carry all the supplies at the workroom – the pattern, magnetic snaps, and o-rings! haley – you should definitely make your own! i hope i get to see a photo of it when it’s done. blake – liesl & co. is the same designer that does the oliver + s clothing patterns. everything she designs is so cute. heodeza – thanks! making clothes is so fun, start with something simple and you’ll be making dresses in no time. kenzie – i’ll keep trying to inspire you to make clothing. 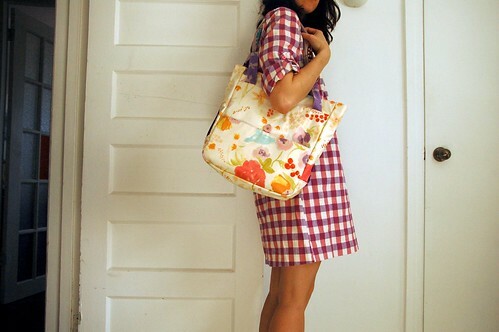 i’ve seen some adorable oil cloth lunch bags, that’s a great project for this fabric. concha – you could make a matching raincoat! charlotte – i too have a little stash of robots set aside. i don’t know how i’ll bear to make something with it. it’s like GOLD! ginetta – you’ll have fun making this bag! angela – thanks so much! nora – you can do it! let me know if you want some help starting off. huebscher – i bring my dslr camera everywhere, so i had to customize it. next i need to make a camera case. 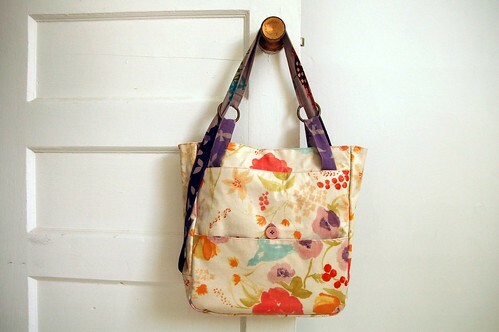 gretchen – when i made the bag i considered the oil cloth as a heavy weight fabric, so didn’t use the extra interfacing. i cut the recommended amount of fabric and had a reasonable amount left over. i will be able to make something small with my leftover oil cloth. i found it pretty easy to sew with, but i think it can depend on your sewing machine, as well. i tried to put some pointers in my post above. hope it goes well, send a picture when it’s done! britt – thanks! we have the pattern at the workroom. I love the backpack and the dress. Would you ever consider doing an on-line class? I always love the dresses and other projects you make. I’d take every class at the workroom if I lived a bit closer. Maybe you’d sell the pattern/tutorial for this gingham dress? I’ll keep my fingers crossed. This bag is just wonderful. I’m coming in this weekend to pick up the pattern, and if there’s any left, the fabric. It’s really pretty. I have this pattern but haven’t made it up yet. You’ve inspired me to put it on my list! Hi Can you I please ask where you bought the laminated nani iro fabric from? we sell the laminated nani iro fabric here at the workroom. we also sell the double gauze and linen/cotton blend nani iro as well. I love your bag! Do you still have the laminated nani iro in your store? i love this bag! Is it for sale?